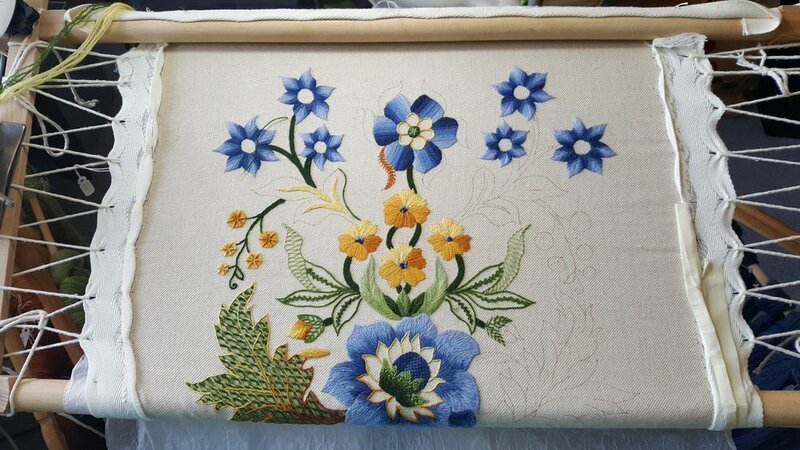 Louise Dawson will be demonstrating several fundamental stitches that are widely used in crewelwork at this weekend’s Crewelwork Taster Class. Crewelwork is defined by the materials used - crewel wool worked on a linen twill. The stitches used are exactly the same as any surface embroidery stitches (for more see our fundamental stitches post). We will be working with traditional linen twill which is woven in Scotland and Appleton’s 2 ply Crewel wool which is produced in England. For this class we have taken a leaf design from one of the hundreds of hand drawn paper designs we hold in our collection. Some of these beautiful paper designs will have been practice designs when the pupils were learning at the School and some were made for bespoke patterns for clients. Some will also have been 'stock' designs to show prospective clients what they could have made. The leaf in this paper design is repeated but with the intention of filling in each one individually with a number of different stitches and patterns. We plan to develop our leaf sampler into a cushion kit later in the year. The stitches in this taster class will be based on some of the stitches used in our soon to be launched Molly Kit - so this is the perfect practice arena! Once you’ve got to grips with the basics there’s no end to the variety of stitches, effects and colour combinations that you can achieve with this beautiful and versatile technique.